Boeing hopes to make a delayed first delivery of its 767-based KC-46A tanker to the US Air Force before the end of December, after completing Phase II receiver aircraft tests with a Boeing F-15E. Conducted from Edwards AFB, California over three weeks, this followed previous trials involving passing fuel to a Boeing B-52, C-17, F/A-18, KC-135, Fairchild Republic A-10, Lockheed Martin F-16 and another KC-46A. 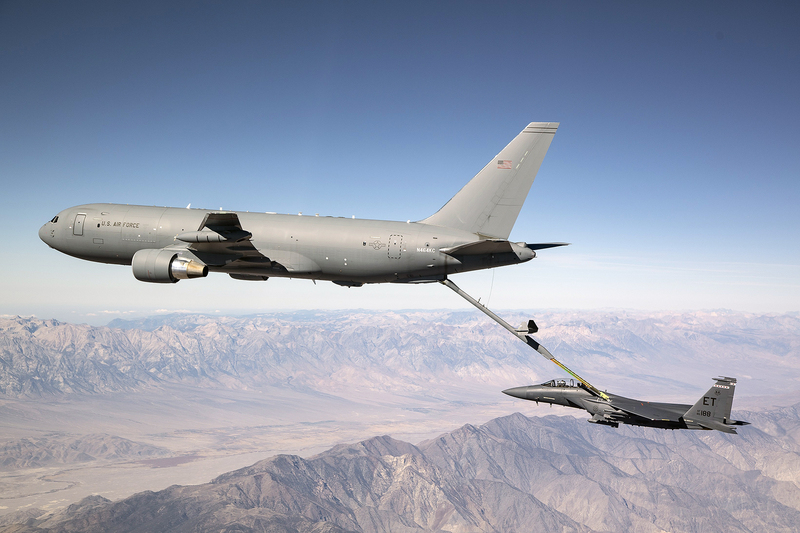 Over the course of testing, six KC-46As have accumulated more than a combined 3,700 flight hours, and transferred more than four million pounds of fuel, Boeing says. A Phase III receiver certification test activity will be performed by the USAF in 2019, including additional aircraft types. Boeing is contracted to produce 52 KC-46As from a programme to replace 179 of the USAF's oldest Boeing KC-135s, which has seen numerous delays and cost over-runs. Five "Category 1" deficiencies caused it to miss its previous delivery target in October.